You must package these items before they can be used. The sequence is very important. Do NOT click Hatch yet. Your nut and bolt has no Troubot Robot in it yet. Click the menu setting "Package". 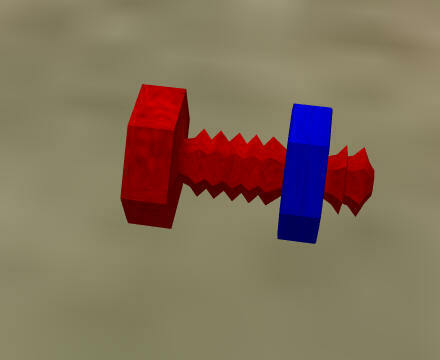 The nut and bolt will disappear and the toolbox will take on the Nut and Bolt colors. 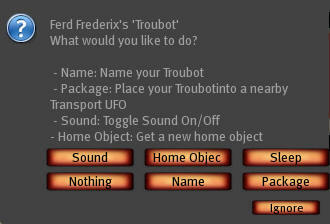 You can take a copy of the toolbox to inventory and this is what will give birth to a Troubot Robot. Click the toolbox and select 'unpackage'. 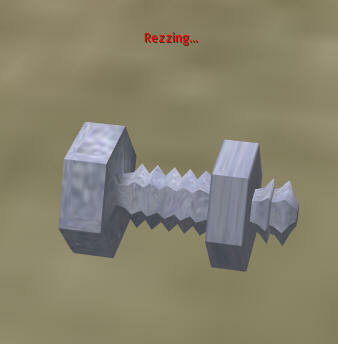 The nut and bolt will appear and the toolbox will delete itself. Click the nut and bolt and select 'hatch'. The Troubot Robot will be born above the nut and bolt, and the nut and bolt will disappear. If there is homing flag out, the Troubot Robot will appear and change colors and drop to the ground. If there is no flag nearby, the Troubot Robot will stay in mid-air . Either rez the home flag and touch it, or click the Troubot Robot to get the Home flag from the menu. Put out a Home Flag and touch it. If the Troubot Robot does not move and display the home coordinates. Make sure that you put a distance in meters in the flag description and touch the flag again. Select "Name". Now type 'name, WooHoo' in chat and your robot will be named 'WooHoo'. The Troubot Robot will move to any food that is out in six hours and start to eat. 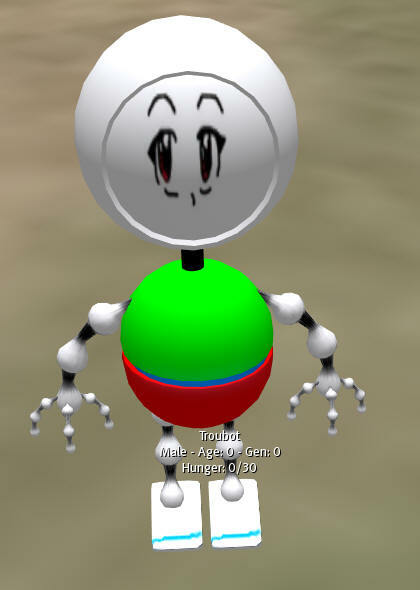 Once you have succeeded in raising a Troubot Robot from an nut and bolt, then clicking a Troubot Robot will bring up hovertext stats and local chat stats, showing such things as colour, name, age, generation, and special conditions or shine and glow. Rez an empty spaceship transport crate nearby. When your crate is ready, click the Troubot Robot and select the menu for 'Package'. Take a copy of the crate back to inventory. Click the spaceship transport crate and unpack your Troubot Robot and verify that the Troubot Robot re-appears. Select Yes to rez the Troubot Robot. You Troubot Robot also has a menu. You can rename the Troubot Robot, turn sounds on and off, set its home to the Homing Flag location, enable the Troubot Robot to sleep when the sim goes into nighttime mode (4 times a day) , or package the Troubot Robot into a crate for transporting in your inventory. A starter kit may contain three toolboxes to hatch from. Troubot Robots take 7 days to mature and are pregnant for 2 days. After seven days it will be mature and will then begin seeking a mate. If a mate is found it will come into contact with the mate and the female will become "pregmant". Nut and bolts can be laid and then put into tooboxes to me moved, sold, or stored. Troubot Robots do not die of old age. They must be fed, though.